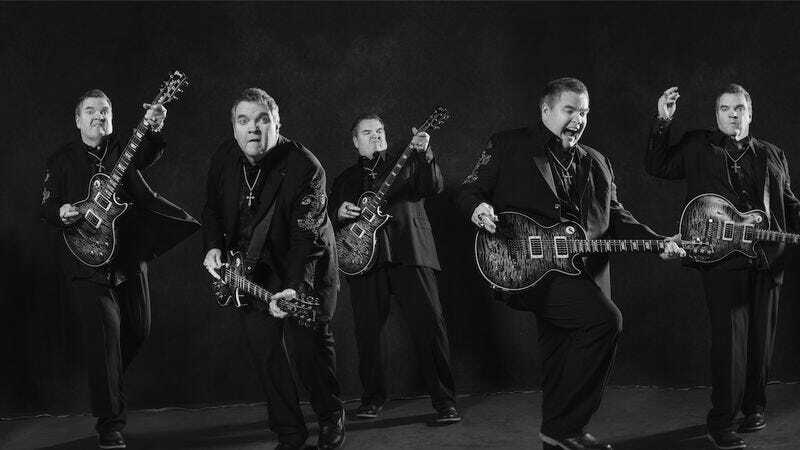 This month will see the release of Meat Loaf’s 13th studio album, Braver Than We Are. Coming nearly 40 years after the release of his cult classic Bat Out of Hell, the album is a continuation of what’s been a long, strange, and successful career in theatrics for the 68-year-old Texas native. (It’s also a reunion with his most successful collaborator, songwriter Jim Steinman.) As a sort of counter-culture polymath, Meat Loaf’s music and acting careers have more or less been one and the same since his breakthrough role as Eddie/Dr. Everett Scott in both the stage and film versions of The Rocky Horror Picture Show. His unlikely success since then has, in many ways, resembled the same kind of theatrical story arc of his music and its rock-opera characteristics. Though that’s not to say it hasn’t been a long, hard, bat-ride out of hell for Meat Loaf. Earlier this summer, he collapsed onstage while performing at a show in Edmonton—an incident later attributed to exhaustion. Given the kind of physical and mental demands of what his performance probably involves, it’s more surprising that it hadn’t happened sooner. But that’s the thing about Meat Loaf. Whether he’s Bob Paulson in Fight Club or singing about tacos with Isaac Hayes, over-the-top is the MO. It was the same in our recent conversation with him, where he was quick to find out just what the hell The A.V. Club was. Meat Loaf: Okay, what is The A.V. Club? The A.V. Club: The A.V. Club is an online arts and entertainment publication. ML: Oh, so you guys are with The Onion? AVC: The A.V. Club is like the more serious sibling to The Onion. AVC: I feel like we’re already to the surreal part of the interview. ML: Listen, my life is surreal. I got news for you: It’s not surreal talking to me. AVC: Your work as a musician has had its surreal moments, though. ML: First of all, Jonathan. Jonathan, right? AVC: That makes sense, given your theatrical background. AVC: Has the acting always come before the music for you? AVC: What was the meaning behind that? ML: I worked six days just on that character. AVC: Where do these characters come from? ML: I’ve never asked Jimmy what he writes about. I never ask why did you write it, what’s that mean or what’s that all about, what’s “Two Out Of Three” about, what are any of these songs about. He knows that I do the characters. AVC: Is it just as easy for you to be that 19-year-old character now as it was in your early 20s? ML: It’s not that difficult, because you do these movies, and you play the good guy, and I’d much rather play the bad guy. I’ve played in some low-budget HBO and Showtime films. I did this one where I was a serial killer [Blacktop], but he was almost schizophrenic. I had so much fun with him. I’ve read three books about [Marlon] Brando, and I do what Brando does, even with the vocals. Brando, when he would get a script, before he would ever start working on lines, he would get the mannerisms of the character. Is he left-handed? Does he walk with a limp? Does he pull on his ear? Does he constantly play with his hands? What does he do? If you go sit in the mall and sit on a bench in a mall, and sit there for an hour and just watch people walk by, everybody has a mannerism. When I’m on tour and I’m in a downtown area, I will sit at my window and watch everybody walk around. There was a time once, in Dublin, we were across from a bar, and it was summertime, and they were drinking outside. You could see this group of guys, and you could watch this guy desperately trying to fit in with this group. The group I didn’t study. I studied him, because I said I’m going to use him one day, trying to do that, fit in. AVC: Is there a sort of method acting approach you’re taking when you create these characters? AVC: So there’s a kind of detachment from your music once you’re done with it. ML: Well, I’ll give you a perfect example. You hear an actor, used to be they’d go on Leno or Letterman, and they’d ask the actor, “Did you see the movie?” and they’d say, “No, I can’t ever watch myself in a movie,” and that’s a dead giveaway. They’re playing themselves, and it’s like a phone answering machine. You’re going to listen to your voice on a phone answering machine and hate it. Well, that’s what these actors have done. They’ve created a phone answering machine on film. I have watched every movie I have ever done, because I never see myself. I disappear, I don’t exist. Meat Loaf, on Braver Than We Are, does not exist on any of these songs. Meat Loaf live does not exist on any of the songs, live. I don’t listen to myself sing live. I’m in a whole other world. It’s like when I shoot a film. When we’re in rehearsals, I see all the cameramen, I see the grips, I see all that. The minute that director yells action, I don’t know how, but they all disappear except for the actor or actors I’m working with. If they’re there, if I’m still seeing them once the director yells cut, I will turn to [the director] and go, “Let’s do that again.” In TV, that’s unheard of, but I’ve never been turned down. AVC: Of course not. You’re Meat Loaf. ML: That has nothing to do with it. I’ve worked with Brad Pitt, and I saw Brad Pitt get turned down. I think it has to do with the way I say it. I think I’m intimidating. AVC: You said you’d watched every movie you’ve been in. Is there a particular favorite? ML: Well, I really like Fight Club because of the director, David Fincher. I hardly spent any time in my trailer for almost 10 months. I sat next to David the entire time. Well, not next to him—I would have driven him crazy—but close, like behind him, so I could see what was going on and what he was seeing. It got to the point, about four or five months into filming, that we’d break for lunch, and Fincher would call me into his trailer and say, “I want you to help me pick which one I should use.” Of course, in my head I’m going, “What?” The first time he did that, I said, “I can’t do that,” and he goes, “Yeah, you can. You’ve been sitting next to me, so help me pick out the best one.” His average take was 44, so we’d sit there and watch 40 takes, and he’d go, “Which one did you like the best,” and I’d say something like, “Well, it’s either 24 or 26,” and he’d say, “I agree with you, 26.” The other movie was written by Arthur Miller, called Focus, with [William H.] Macy and Laura Dern. Arthur Miller’s characters are very complicated, and very intelligent, even though a lot of them don’t know that they are intelligent. You have to play them stupid, while still being intelligent, which is really hard. AVC: It seems pretty similar to how you approach your music’s characters. ML: Exactly, it’s exactly the same. AVC: Has that always been the case? ML: We watch The Voice, and last night, they had on Miley Cyrus, who I thought I was going to hate, but I didn’t. I really liked her, I thought she was very smart. I want to go on so bad as a guest coach one day, and tell them all they’re doing it wrong. When Christina Aguilera was there, she’d say something like: “You’ve got to feel the song,” and no, that’s wrong. You don’t feel the song. You become the song. You are the song. Then they go, “You have to control the stage,” and I just want to go, “No! You control the room!” You don’t control the stage. You control the room. There’s a technique that you learn in acting classes on how to do those things. The other thing, and I’ve told different artists—I won’t tell you who they were—but I’ve told them to stop playing to the front row. They look at me and ask why, and I’ve said it’s because those people that paid $60 or $70 that are sitting in that balcony up there think it’s an inside joke, and they’re being left out of it. You want to play to the back of the room, because when you play to the back of the room, everybody in that room thinks you’re singing to them and nobody but them. I get that on Facebook a lot. People will comment saying they were at the show, and it was unbelievable, because it was like I was singing to them personally. I started taking acting classes to get out of study hall when I was a sophomore in high school, and I got hooked. That’s the first thing they teach you, almost, is you play to the back of the room. On Broadway, when you do a Broadway show, in every Broadway theater, if they have a middle aisle—and even if they don’t—there was always a round clock on the wall. Next time you go to a Broadway theater, look up on the wall, you will see a round clock. Every director will tell you, you play to that clock. AVC: There are many layers to you, Meat Loaf. ML: [Laughs.] I’m a very complex human being.